Getting a Bunk Bed can be an exciting time for your child. However, it can be a little more complicated than buying other furniture for your home. When choosing a bunk bed there are safety issues to be taken into account. You need to make sure that the space available accommodates the safety features.You do not take chances with the safety of the people big or small who will be using the bed. Bunk beds are great for for smaller spaces but can work well in larger rooms especially where you want to use floor space for other activities. Start by measuring the floor space then check the ceiling height. You need at least two feet of space between the bunk and ceiling to avoid bumps. The features you choose on bed may require additional space like opening drawers. There are many types of bunk beds ranging from the basic to more complex combinations that cater to different needs. There are configurations that offer triple sleeping surfaces. 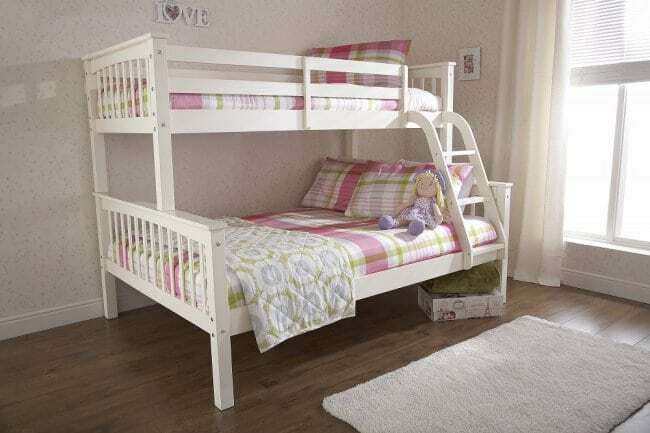 These can be handy for sleepovers or when three children share a room View our range of Bunk Beds. Special features, such as study areas, storage, or play features are available to suit the age and needs of your child. Ask your child’s opinion, they may have seen something you might be overlooking. There is a wide range of styles to choose from. You have a choice of materials that you can select, such as all wood, all metal, or a combination of the two. This entry was posted in Bunk Beds. Bookmark the permalink.